(CNN) -- A wildfire stoked by heavy winds, high temperatures and low humidity burned high-end homes Wednesday in the foothills of Santa Barbara County, California. 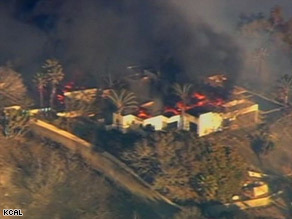 A wildfire in Santa Barbara, California, is burning high-end homes in the area. The fire, which started Tuesday and engulfed about 200 acres by Wednesday evening, comes about a half-year after the so-called Tea Fire destroyed about 200 homes in the Santa Barbara area. Fire officials on Wednesday would not confirm any structural damage. But they did not dispute local media reports, which included video of homes engulfed in roaring flames. "The fire is moving very, very rapidly," said Santa Barbara County Fire Capt. David Sadecki. "This is an uncontrolled wildfire." Evacuation centers have been set up across the county for people as well as animals. Large animals can be taken to Earl Warren Showgrounds in Santa Barbara, county officials said. The Santa Barbara Humane Society in Goleta is taking care of small animals. Firefighters hoped calmer winds earlier Wednesday would help them get the blaze under control, but reported gusts as high as 60 mph kicked back up later, Sadecki said. On top of that, temperatures as high as 102 degrees and low humidity were giving the fire plenty of ready fuel, Sadecki said. About 2,000 homes had been evacuated by Wednesday evening, Sadecki said. Only one minor injury -- a firefighter who hit his head -- had been reported. Firefighting helicopters, which had been used to dump water, were grounded late Wednesday because of the winds, according to Sadecki. Also Wednesday, wildfires that were believed to be set by people were burning in Arizona near the Mexican border. One blaze covered about 4,000 acres near the city of Sierra Vista. It had destroyed three homes and sent a resident of the area to the hospital with third-degree burns, according to the National Forest Service.